In an exclusive television interview with CNN’s Richard Quest (@RichardQuest), Malaysian Prime Minister Najib Razak says he’s prepared to release the preliminary report on Malaysia Airlines Flight 370 next week, even though he refuses to declare the plane – and the 239 people on board – lost. PM NAJIB: I have directed an internal investigation team of experts to look at the report, and there is a likelihood that next week we could release the report. PM NAJIB: The military radar, the primary radar has some capability. It tracked an aircraft which did a turn back, but they were not exactly sure whether it was MH370. What they were sure of was that the aircraft was not deemed to be hostile. PM NAJIB: There were, I believe there was a man who was monitoring the radar screen but the interpretation was done after the event. PM NAJIB: No because, simply, it was deemed not to be hostile. PM NAJIB: You see I’m coming back to my earlier statement – they were not sure whether it was MH370. PM NAJIB: They were not sure. But it behaved like a commercial airline following a normal flight path. PM NAJIB: At some point in time I would be, but right now I think I need to take into account the feelings of the next of kin — and some of them have said publicly that they aren’t willing to accept it until they find hard evidence. RICHARD QUEST, HOST OF QUEST MEANS BUSINESS: Good morning from Kuala Lumpur. Good evening to you. It is 4:00 in the morning, and tonight, we have an exclusive interview with the prime minister of Malaysia who, in a wide-ranging discussion, gives his first impressions on that night and tells us the plane was tracked on radar, but nothing was done when they spotted MH370. 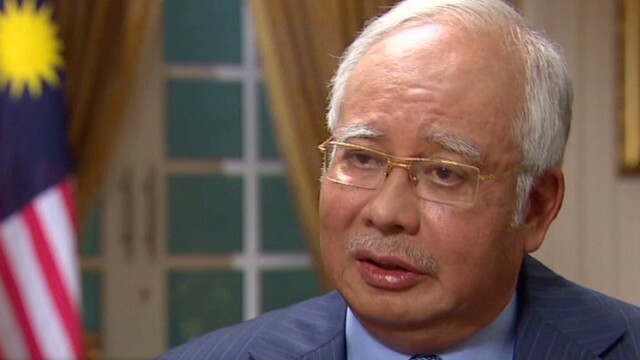 The PM refuses to say that the missing Malaysia plane and its passengers are lost. He won’t do so for the sake of the next of kin and the families. He admits that shortcoming were made, that the presentation was not good. But he’s proud of the way Malaysia put together its coalition of 26 countries involved in the search. And he gives us the firm undertaking that Malaysia will continue the search until it can no longer afford it. All that in just a moment as we have the prime minister of Malaysia in this exclusive interview, where we start off talking about the brutal, unpleasant, and raw fact that Malaysia has been accused of bungling the investigation in the early days. And frankly, the name of Malaysia has been kicked around the world. QUEST: The country has had real kicking over the perspective and perception of the way it handled those early days. I think the phrase used in many cases is Malaysia bungled it. NAJIB RAZAK, PRIME MINISTER OF MALAYSIA: I have to be quite frank with you. I think, first of all, let’s start from the premise that it was unprecedented. We all agree it was unprecedented. It was the most technically challenging, most complex issue that Malaysia or any country, for that matter — and I believe even an advanced country will have great difficulty handling such an issue. Some of the things we did well. We were very focused on searching for the plane. We didn’t get our communications right, absolutely right to begin with, but I think towards later part, we got — we got our act together. So, I’m prepared to say that there are things we did well, there are things we didn’t do too well, but we’re prepared. We’re prepared to look into it and we’re prepared for this investigation team to do its objective assessment. QUEST: In the last 24 hours, you’ve had a very good example of what the critics say. The preliminary report. Now, not only did Malaysia not announce that it had submitted the preliminary report, it’s still deciding whether or not to tell us we had it and to release it. Even though it’s got a safety recommendation within it. Now, I’ve covered enough air crashes to know that almost never — almost always is the preliminary report published. So what we have here, Prime Minister, is an investigation or a minister who speaks the language of transparency, but the practicalities of seeming to do the opposite. NAJIB: I hear the voices out there, Richard. And so, I have directed an investigation — internal investigation team of experts to look at the report. And there’s a likelihood that next week, we could release the report. QUEST: Why not release it now, Prime Minister? Is there something in it that’s embarrassing to Malaysia? NAJIB: No, I don’t think so. But I just want it to be — this team to go through it. But in the name of transparency, we will release the report next week. NAJIB: We will release it. QUEST: The sheer number of facts that are unknown about what happened when Malaysia 370 disappeared is quite staggering. From the moment after it made the turn to when it crossed the country all the way to where the plane and those onboard rest at the moment, believed to be deep, deep into the south Indian Ocean. Over the past six weeks, there have been many myths, rumors, and leaks. But tonight, we hear from the man who really knows the facts. He is Malaysia’s prime minister. Speaking to us in a broadcast exclusive, we talk to him about the details of what happened after the plane made the turn, and who saw what in the Malaysian military as it flew that night. NAJIB: Now, the military radar, the primary radar, has some capability. It tracked a — an aircraft, which did a turn back. But they were not sure — exactly sure whether it was MH370. What they were sure of was that the aircraft was not deemed to be hostile. QUEST: No planes were sent up on the night to investigate? NAJIB: No, because — simply because it was deemed not to be hostile. QUEST: Don’t you find that troubling that a civil aircraft can turn back, fly across the country, and nobody thinks to go up and have a look. Because one of two things. I understand that the threat level and I understand — either the plane’s in trouble and needs help, or it’s nefarious and you really want to know what somebody’s going up there to do. So as prime minister, don’t you find that troubling? NAJIB: You see, I’m coming back to my earlier statement that they were not sure whether it was MH370 or not. QUEST: Even more reason to just go up and have a look. NAJIB: They were not sure. But it behaved like a commercial airline. QUEST: Moving to, then, when the Inmarsat data is brought to your attention. Did you have any doubts when Inmarsat said, and your advisors said, “We believe, now, the plane flew for seven hours or so, six and a half hours or so, and this is where it went.” Did you — you must have had quite a shocked reaction. NAJIB: To be honest, I found it hard to believe to begin with, because how could a plane that was supposed to be heading towards Beijing — they could decide that the plane ended halfway towards Antarctica. It’s a bizarre scenario, which none of us could have contemplated. QUEST: Are you prepared now to say the plane and its passengers have been lost? NAJIB: On the balance of the evidence, it would be hard to imagine otherwise, Richard. QUEST: But the significance is that until Malaysia says the plane has been lost, the compensation packages, the next stage of the proceedings under the Montreal Convention, can’t take — go ahead. So, I ask you again, Prime Minister, are you prepared to say that the plane and its passengers are lost? NAJIB: At some point in time, I would be. NAJIB: Right now, I think I need to take into account the feelings of the next of kin. And some of them have said publicly that they’re not willing to accept it until they find hard evidence.